On the episode of 'The Simpsons' that aired last night, Homer becomes a TV pundit and must endorse a Republican presidential candidate. Looking over the list given to him by Mr. Burns, America's favorite bumbling father and nuclear-power-plant employee appears unmoved. He considers changing parties, but then Ted Nugent steps in. "No one's voting Democrat while I can still draw a bow!" Nugent declares, shooting off Homer's gravy-boat hat with an expertly shot arrow. 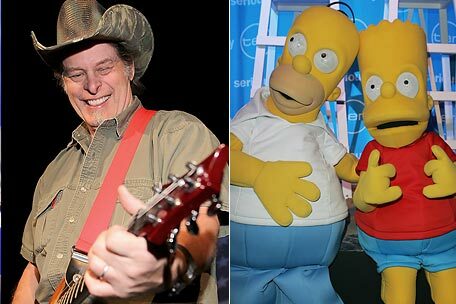 Arguably better known for his conservative politics and blatantly pro-gun, pro-hunting, anti-everything-liberals-hold-dear persona than for his music, the Nuge lent his voice to the episode, gamely poking fun at his image. As the plot unfolds, he runs for president, thanks to Homer's endorsement. "I made love on my honeymoon to your sweet music," Homer tells Nugent, unperturbed by having an arrow shot at his noggin. "You're my man!" While Homer's criteria for picking candidates is unorthodox, there might be something to it. Over the last few decades, had Americans voted in accordance with their wedding-night soundtracks, Presidents Marvin Gaye, Prince, and Barry White probably would have kept us out of a few wars.